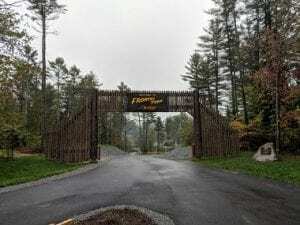 SUNY-ESF has announced they are expanding the existing trail network at the Newcomb Campus, and are seeking Summer Trail Crew Members. 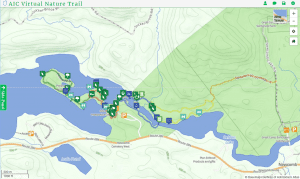 Work will include adding more than two miles of new trails at the Adirondack Interpretive Center (AIC), as well as rehabilitating the popular Goodnow Mountain trail. This trail expansion is the first since the AIC opened in 1990. » Continue Reading. 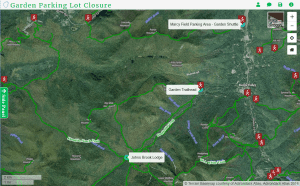 The Garden Parking Lot at the Garden Trailhead – one of the main access points to the Eastern High Peaks Wilderness and the nearest trailhead to Johns Brook Lodge – will be closed to public motor vehicles during the spring and summer of 2019 due to the replacement of the Johns Brook Bridge. Construction of the replacement bridge, located in Keene Valley, Essex County, is expected to begin as soon as weather and road conditions allow and is expected to last through the summer, according to Town Supervisor Joe Pete Wilson. No vehicles or pedestrians will be able to pass the bridge once construction is started through completion of the project. » Continue Reading. 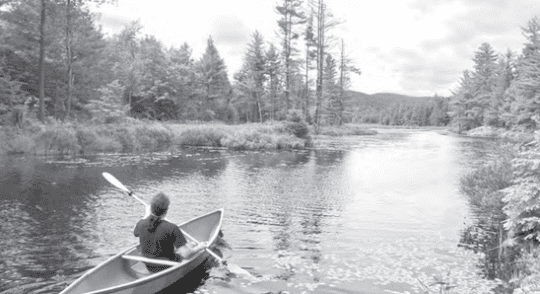 With a few strategic land acquisitions, a new marketing and branding campaign and the support of businesses, local government and not-for-profit organizations, Bolton can become the recreation hub of the southeastern Adirondacks a new plan in the offing says. A new document, “Bolton Recreation Hub Strategy,” prepared by the Chazen Companies for the Lake George Land Conservancy and the Town of Bolton, explains the benefits and costs of becoming a recreation hub, and how it can be done. » Continue Reading. I am thankfully every day that my children are healthy. It is something I never take for granted. Though neither of my kids have ever been seriously sick, we all saw our young cousin’s struggle with stage 4 cancer. I’m not going to dwell on the devastating effects this type of diagnose has on any family, but I will mention that any moments of joy woven through those trips to the hospital and countless mental treatments lifted spirits. It’s those moments of happiness when children have the chance to remember they are still children. 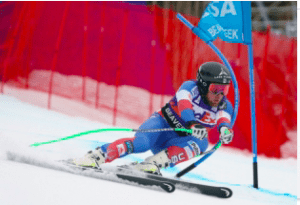 I was thrilled to read that World Cup Alpine Skier and Winter Olympian Andrew Weibrecht has been a trustee for the Northeast section of Make-A-Wish Foundation. » Continue Reading. 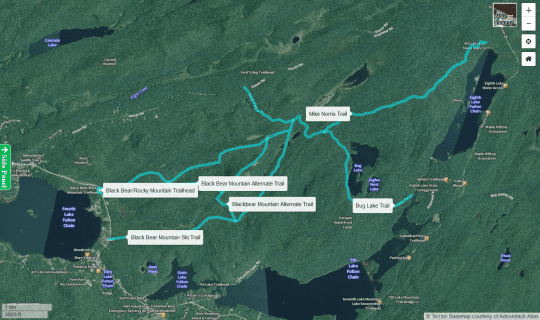 Black Bear Mountain Ski trails are in the part of the Moose River Plains Complex which lies West of Route 28, between Fourth and Eighth Lakes in the Fulton Chain of Lakes. Black Bear Mountain Lower Ski Trail extends 3 miles from private land along State Route 28 to the Bug Lake Trail. The trail follows for 0.4 miles along an easement over private land and continues easterly for 2.6 miles. Wet areas make portions of the trail unsuitable for use during non-winter seasons. » Continue Reading. The Para-Bobsleigh World Championships are set to take place at Mt. Van Hoevenberg’s combined bobsled/luge/skeleton track on March 30-31, 2019. This will mark the first time that this event is being held in the United States. » Continue Reading. Registration is now open for 2019 Weekender at Paul Smith’s College, a family-friendly bicycling event scheduled for June 28-June 30. Introduced by Cycle Adirondacks in 2018, the event was designed with all the amenities and features of CycleADK’s flagship Ultimate Cycling Vacation, but with half the time commitment and a singular event base at the lakeside campus of Paul Smith’s College. » Continue Reading. 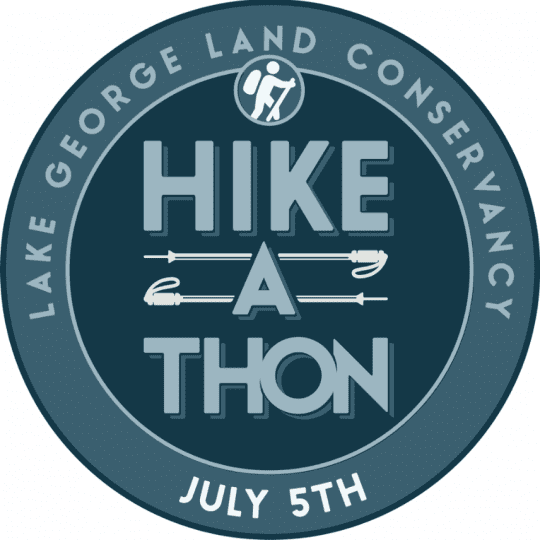 Early-bird registrations for the Lake George Land Conservancy’s (LGLC) Hike-A-Thon have set new records for the event organizers say. Now in its 7th year, the online registration form went live March 4; just 24 hours later, 363 people had registered, filling up five of the 17 available sites. One week later, the registration total reached 450. With an expected attendance of more 600 hikers, paddlers and volunteers, the Lake George Hike-A-Thon continues to be the LGLC’s largest event. Always scheduled for July 5th, the event has rotated through the days of the week; this year the 5th lands on a Friday, which may be one reason for the huge response. » Continue Reading. 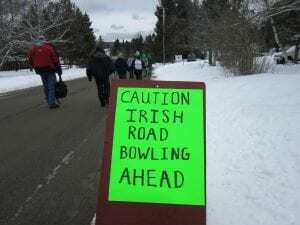 My family has consistently been a part of the Irish Road Bowling tradition that takes to the streets of Indian Lake each St. Patrick’s Day weekend. Last year we joined over 60 teams to take turns bowling along the lane with the hopes of finishing with the lowest score. Don’t worry if you don’t like to bowl, the costumed teams make it just as much fun to watch as it is to play. » Continue Reading. 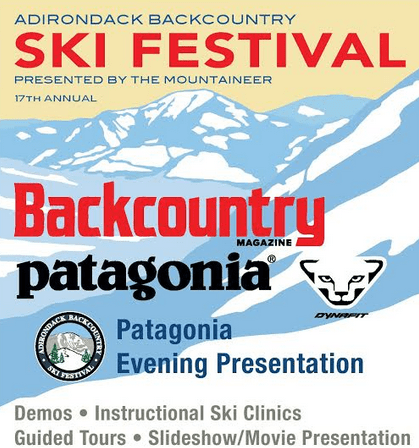 The Mountaineer in Keene Valley, is set to host the 17th Annual Adirondack Backcountry Ski Festival the weekend of March 15-17, 2019. 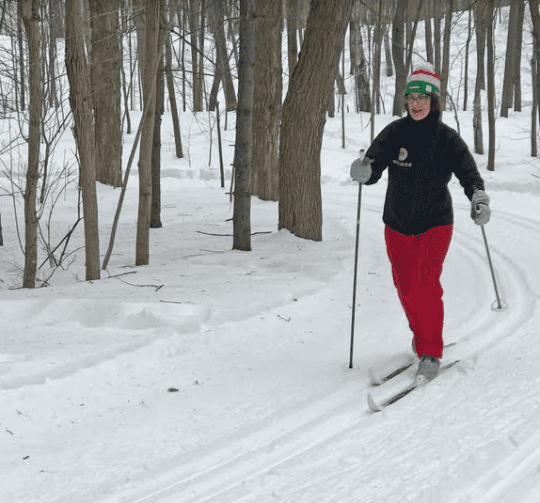 Backcountry skiing combines all of the elements of touring, climbing and downhill skiing into one winter mountaineering experience. » Continue Reading. 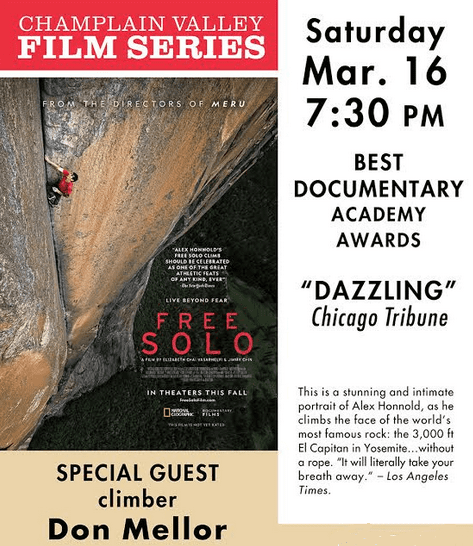 The Champlain Valley Film Series is set to present the documentary Free Solo, with special guest renowned climber, author and Adirondack guide Don Mellor in Whallonsburg, March 16th. Mellor, author of four Adirondack rock and ice climbing guides, and other books. He has climbed El Capitan and other Yosemite walls and will answer questions after the film » Continue Reading.